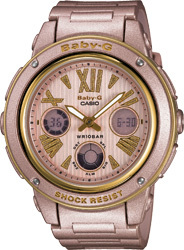 This exciting new collection is the result of collaboration between Baby-G and Girls' Generation, an all-girl pop group that has been taking Asia by storm. 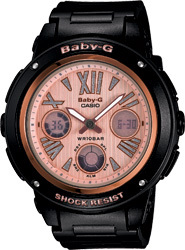 the BGA-300 model uses black light reflective paint on the hands and face, so they change color to blue or green when exposed to black light. Hour markers have a metallic finish that adds a sharp accent to the face design. 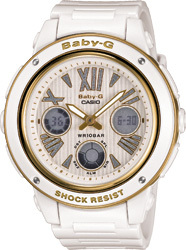 The glittering Gemmy Dials of the BGA-153M models combine with a stripe pattern half-matte face and matte finish face ring for a look suited to a fashionable wrist accessory. 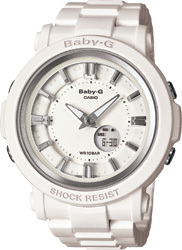 Button guards provided Baby-G level protection against impact damage. These models come with a specially designed UV mirror and distinctive Girls' Generation packaging.